By the age of one, Jax was pounding hundreds of dents in the coffee table with spoons. By the age of two, he graduated to chop sticks on the couch. 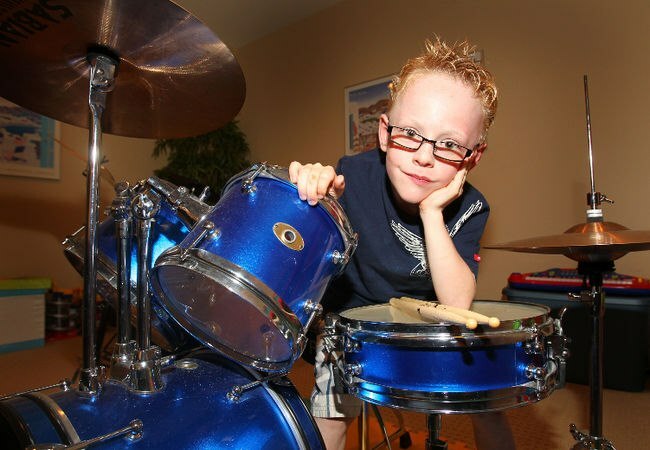 At three, he got his first drum kit and started doing live shows for hundreds of people. No one can tell the story of Jaxon better than his father, Kevin Smith, in this video which was produced by Kerianne Sproule for The Weal dot com. Note: Jaxon the 3 years old, is certainly not as half as good as Jaxon the 6 years old, but you simply have to admit that Jaxon the 3 years old is way more adorable. Fast forward from Apr 22, 2009 (the date of the first video) to Feb 9, 2012. Almost 3 years later and 29 videos after his first video, Jaxon did a cover for Foo Fighter’s Pretender. It took the video 3 or 4 months to go viral, but once it did, Jaxon was noticed by NBC and got invited to participate in NBC Today on July 17, 2012. His video also appeared on Good Morning America, CNN Headline news, numerous shows in Europe and Japan and national TV and newspaper coverage in his home country of Canada. Jaxon’s Youtube channel currently has a total of 1.7 Million youtube views and counting. I predict a very bright future for Jaxon. why? 1- Because he is very active, he has great passion for music and for playing the drums. 2- It is obvious that his father Kevin Smith is very supportive to his son’s career. Finally :), I wish Jaxon Smith great years of success to come… and I will leave you with the 9 years old Jaxon, enjoy.